This artwork received the Golden Award of the 2015 Graduate Exhibition of the Chinese Painting Department at China Academy of Art. It was the first time in history that a foreign student was awarded gold at this most prestigious department. The painting merges together East and West in various ways. 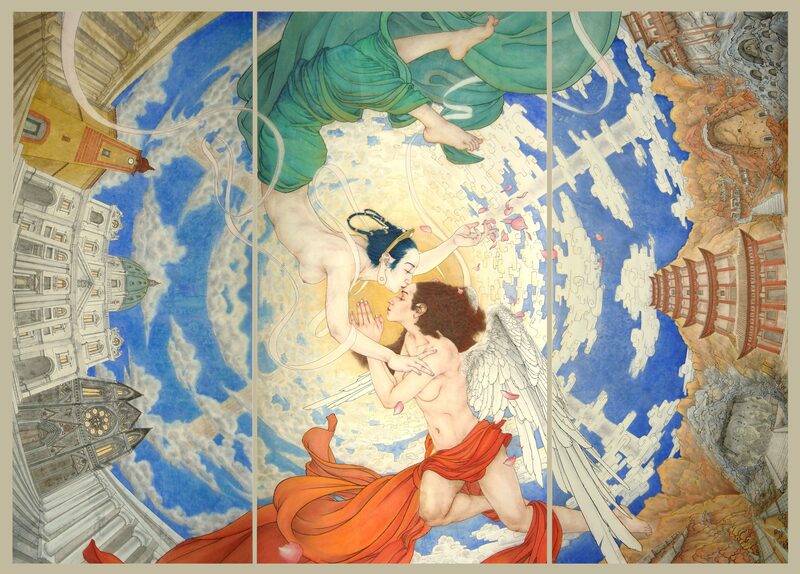 Suspended underneath the same Heavens, Buddhist Apsara and Christian Angel are immersed in an intimate wordless dialogue. The perspective, scope, and large scale dimensions of the composition reference western plafond paintings, eastern Buddhist cave art and Thang-ga (唐卡). The perspective leads the viewer’s eye to the centre of the painting where a circle painted with gold represents divinity and faith. The precise linearity of the far-eastern tradition fuses with richness and purity of colours from the western tradition. Although modeled after females, the character of the Apsara is strongly based on conceptualized images from Kizil grottoes in Xinjiang, China. Angel on the other hand is more of an imaginative, realistic figure with androgynous features. The Christian tradition is represented in the painting by the St. Peter’s Basilica with the colonnade, Prague’s Cathedral (with Cologne Cathedral’s features) and the old church in Kroscienko nad Dunajcem. Speaking for Buddhism, there are famous, ancient, religious art sites in China – Dunhuang, Kizil and Longmen Grottoes, as well as Datong Hanging Temple. Skies and clouds, initially different from each other, eventually merge into one. 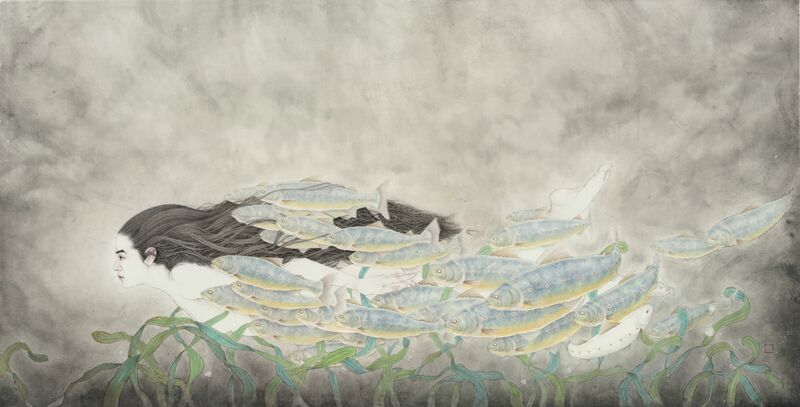 A shoal of fish encircles the body of the perfect idol and follows her blindly. The fish are eyeless, soulless, and without meaning. However, among them there is one fish visibly different, an albino, turned against the current. Its human eyes observe clearly, staring at the audience. Gradually decaying water weeds suggest the results of blind obedience. The higher we look on the painting, the brighter it gets; almost revealing the surface and source of light.....almost. The emptiness of deep water feels suffocating and presses viewer’s eyes to the bottom, but at the same time calms us down. Practice, practice and practice... over two years, more than seven hundred days and nights, thousands of diligently cultivated characters. From one brush stroke to another, learning through copying masters - Yan Zhenqing’s “Fairy Altar at Magu” and Zhu Suiliang’s “Yinfu Sutra”. 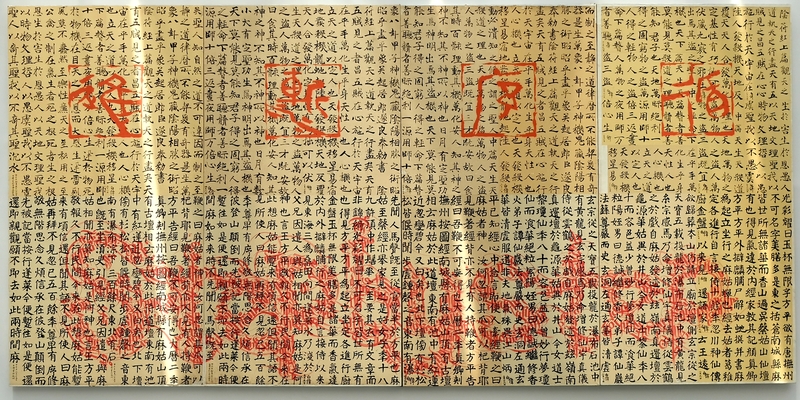 The artwork was created from numerous calligraphy practice sheets written in two styles. First, selected carefully from different periods, then arranged according to time order (right to left) and style (“Yinfu Sutra” on top, “Fairy Altar at Magu” on bottom). Four vermillion characters written in the ancient Great Seal style appearing at the top to form the Chinese idiom “xun xu jian jin” (循序渐进) which stands for “steady progress”. They solidify composition and give a deeper meaning to the artwork. 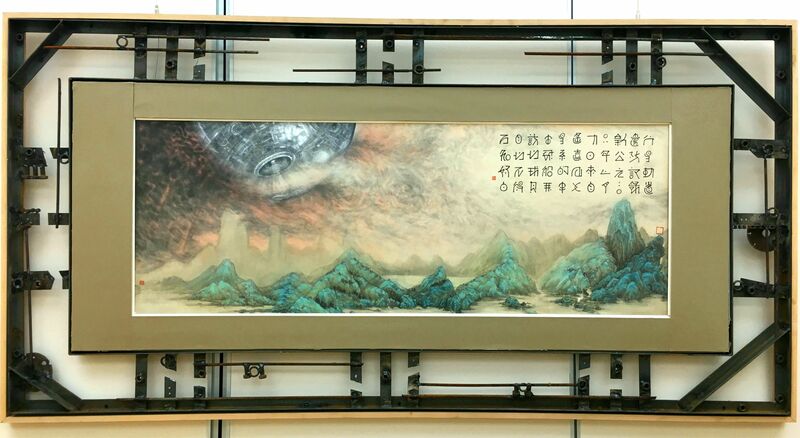 This painting combines the traditional blue-and-green Chinese landscape painting with the science-fiction genre. An enormous, spherical spaceship enters the planet’s atmosphere causing confusion and producing glowing clouds. Stylized, alien-looking colophon is a metaphorical note from the fictional Orbital Guards Chronicles written with transfigured Chinese calligraphy. “From the Orbital Guard Chronicles: day 9 of the 7th month, year 2008 of the New Era. A spacecraft from the distant Andromeda galaxy arrived on our planet. Purpose remains unknown. So white. Frame was designed by the artist and welded specifically for this painting. It enriches the artwork with Bagua (eight trigrams) - a motif innate for traditional Chinese culture, which abstruse meanings relate to philosophy, cosmology, astrology, etc. This painting is part of the "Encounter" series.